It is now widely acknowledged (and proven) that email is one of the best channels for ecommerce marketers to grow and engage with their customer base. According to American Express, the reason email works so well as a B2C communication tool is that consumers are firmly in control of it: they decide whether they want to read it, delete it or unsubscribe for good. And it is this power that (somewhat unconsciously) encourages visitors to sign up to ecommerce newsletters if they specifically like your products, and they want to take advantage of an incentive you’re offering. Having said that, growing your email list with interested subscribers that purchase regularly and are brand advocates is the ultimate goal, and is also a big challenge for marketers. There’s no right or wrong location for your signup box, you simply need to test different options to see which works best for driving signups on your website. We suggest running tests by placing the signup box in different locations on your pages to see how many new subscribers you get. Should you have it in your homepage footer or header? Or in the middle of your homepage? It also doesn’t have to be in only one place - you can (and should) create various opportunities for visitors to subscribe. 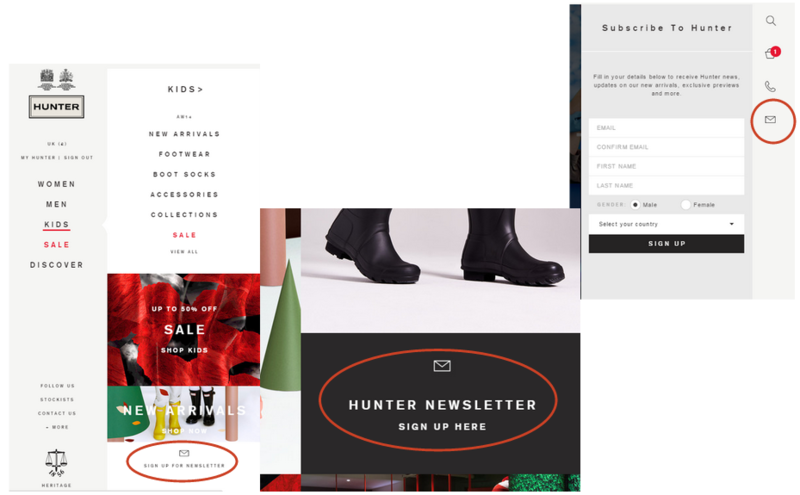 Hunter allows you to sign up in all category pages (menu on the left), on the navigation menu (on the right), and on their main homepage (middle). 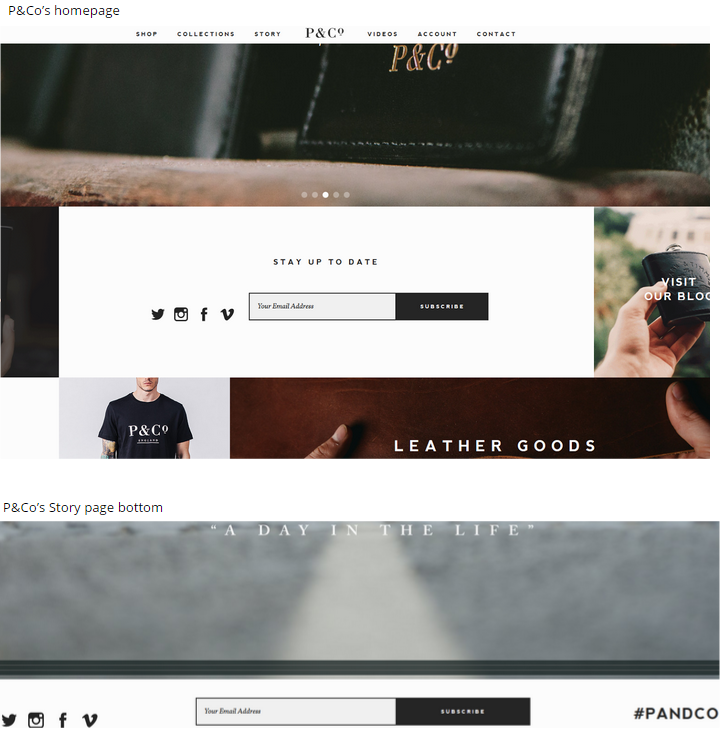 The fashion company has its signup box very clearly placed right in the middle of their homepage, and also highlighted in their ‘Story’ page. In addition to signup box location, you need to test the signup process in terms of amount of information you ask for. Some retailers ask for a bare minimum in the initial signup process and attempt to find out more later, while others ask for more details upfront. 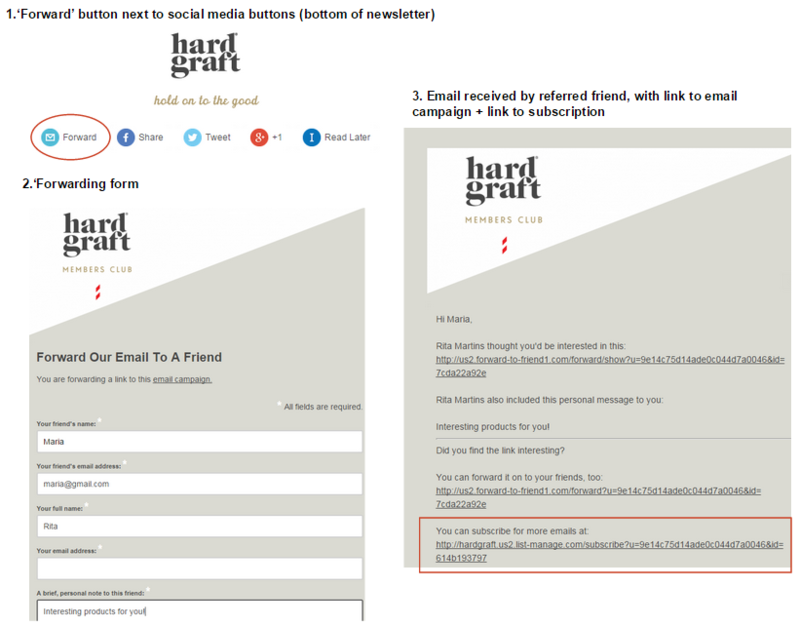 Following our intro about growing a quality mailing list, we’d strongly advise you ask customers for email permission at checkout using opt-in boxes, rather than opt-out ones. When making a purchase, customers usually assume that small line of text is asking for their permission to be included in your list, instead of asking for their exclusion from it. And for those customers who prefer to keep their inbox free from promotional emails, getting unwanted emails because they didn’t tick the opt-out box can have negative consequences for your brand. So, to avoid annoying your new customer (and getting higher than usual unsubscribe rates), make sure you have an opt-in choice for your email marketing. 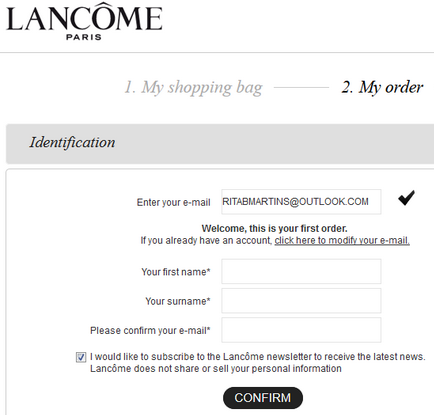 Here is a great example from Lancôme’s checkout (letting me opt-in and acknowledging this is my first purchase). 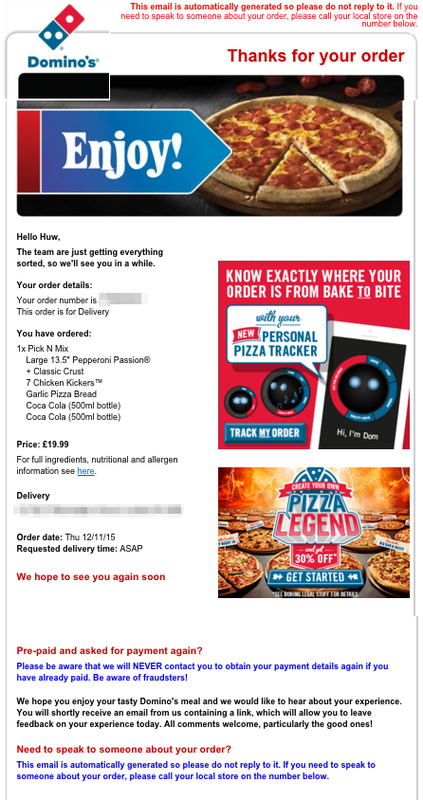 And here is an example of not-so-great practice from the Domino’s Pizza checkout, where you need to tick the box to opt-out of their marketing list. Although controversial, email signup popups that are well implemented and tracked have proved to be an effective tool to acquire new customers. Make sure your email popup only appears to first-time visitors, to those that haven’t purchased yet, and to those who haven’t clicked-through from your emails to avoid frustrating existing subscribers. We've covered email pop up best practice in greater detail in this blog post: 8 Tips for Using Popups to Grow your Mailing list. Leverage your subscribers’ network by giving them the option to send your newsletter to a friend, instead of only sharing to social media channels. The ‘forward to a friend’ process may vary depending on your email service provider, but if you have the ability to implement it you should take advantage of this opportunity and allow your subscribers to share your content (if they think your newsletter is awesome, of course!). And because your newsletter is referred by someone within their circle of friends/family/colleagues, the new receiver is more likely to be actually interested in your brand. Don't forget to include a link in the shared newsletter for the new receiver to sign up to your regular emails, to make sure you reach the goal (getting a new subscriber). A great example - the images below illustrate the two-step process of forwarding a newsletter to a friend, and what the friend will receive. You may not have considered promoting your newsletter in your physical stores, as it’s always a challenge to implement online-offline strategies. There is no easy way to capture emails in an offline setting - however, offline can still represent an important touchpoint with your customers (if you’re an omnichannel retailer, that is). Why not try to engage them and lure them to your online database when they’re actually showing interest in your brand (= when they’re buying in store)? 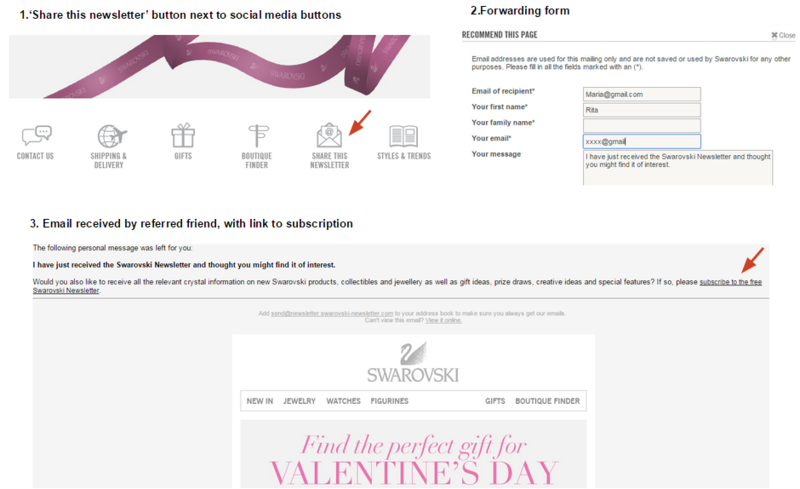 The fashion retailer has recently run an offline campaign to get new newsletter subscribers. Behind their cashier tilts, they offered an incentive of 25% off if you texted them your email address. The discount was only valid on that same day and could be redeemed immediately. I have participated in this campaign, and below is the text message received after texting my email to H&M (and, of course, using the discount!). I also immediately received their welcome email on my inbox, which shows that there is a clear integration between mobile/text data and their triggered emails’ workflow. Social media channels are great for creating brand awareness. And paid social ads can boost your brand if you have specific goals, like getting more newsletter signups. Sponsored Twitter sign up cards, for example, can help increase your mailing list, though it means you need to allocate part of your marketing budget to build a campaign. Unlike the other suggestions we’ve been giving you, implementing a Twitter ad to promote your newsletter is cost-demanding - which is why it should have clearly defined goals. You’re likely to see the best results for targeting these ads at your followers - people who already have a certain level of brand awareness. Social paid campaigns need constant monitoring of signup performance and quality of subscribers as time goes by. 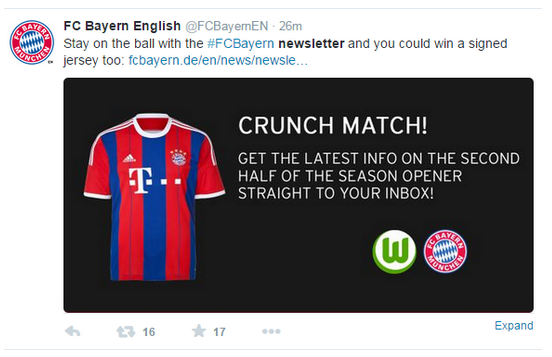 The football club offers the chance to win a prize in exchange for newsletter signup. 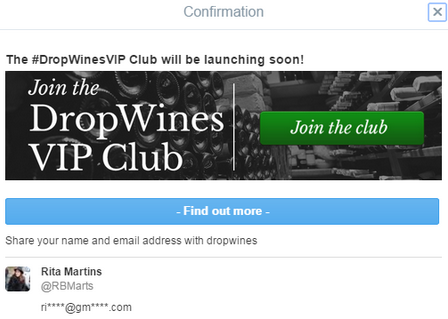 DropWines also uses Twitter ads to get new subscribers to join its club. Although this ad is not exactly promoting their newsletter, it still enables DropVines to capture email addresses and add them to a segmented mailing list. 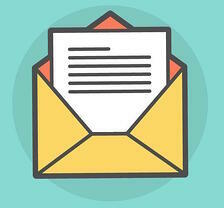 We hope you can now test some of these strategies to grow a sustainable email list!